For other uses, see Prehistory (disambiguation). For a timeline of activities in the early history of the universe and prehistoric Earth, see Timeline of prehistory. Sumer in Mesopotamia, the Indus valley civilization, and ancient Egypt were the first civilizations to develop their own scripts and to keep historical records; this took place already during the early Bronze Age. Neighboring civilizations were the first to follow. Most other civilizations reached the end of prehistory during the Iron Age. The three-age system of division of prehistory into the Stone Age, followed by the Bronze Age and Iron Age, remains in use for much of Eurasia and North Africa, but is not generally used in those parts of the world where the working of hard metals arrived abruptly with contact with Eurasian cultures, such as the Americas, Oceania, Australasia and much of Sub-Saharan Africa. These areas also, with some exceptions in Pre-Columbian civilizations in the Americas, did not develop complex writing systems before the arrival of Eurasians, and their prehistory reaches into relatively recent periods; for example 1788 is usually taken as the end of the prehistory of Australia. The period when a culture is written about by others, but has not developed its own writing is often known as the protohistory of the culture. By definition, there are no written records from human prehistory, so dating of prehistoric materials is crucial. Clear techniques for dating were not well-developed until the 19th century. This article is concerned with human prehistory, the time since behaviorally and anatomically modern humans first appeared until the beginning of recorded history. Earlier periods are also called "prehistoric"; there are separate articles for the overall history of the Earth and the history of life before humans. The term "prehistory" can refer to the vast span of time since the beginning of the Universe or the Earth, but more often it refers to the period since life appeared on Earth, or even more specifically to the time since human-like beings appeared. The date marking the end of prehistory is typically defined as the advent of the contemporary written historical record. The date consequently varies widely from region to region depending on the date when relevant records become a useful academic resource. For example, in Egypt it is generally accepted that prehistory ended around 3200 BCE, whereas in New Guinea the end of the prehistoric era is set much more recently, at around 1900 common era. In Europe the relatively well-documented classical cultures of Ancient Greece and Ancient Rome had neighbouring cultures, including the Celts and to a lesser extent the Etruscans, with little or no writing, and historians must decide how much weight to give to the often highly prejudiced accounts of these "prehistoric" cultures in Greek and Roman literature. 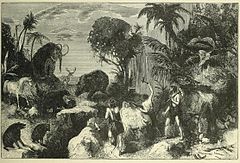 The notion of "prehistory" began to surface during the Enlightenment in the work of antiquarians who used the word 'primitive' to describe societies that existed before written records. The first use of the word prehistory in English, however, occurred in the Foreign Quarterly Review in 1836. The use of the geologic time scale for pre-human time periods, and of the three-age system for human prehistory, is a system that emerged during the late nineteenth century in the work of British, German and Scandinavian archeologists, antiquarians and anthropologists. The main source for prehistory is archaeology, but some scholars are beginning to make more use of evidence from the natural and social sciences. This view has been articulated by advocates of deep history. The primary researchers into human prehistory are archaeologists and physical anthropologists who use excavation, geologic and geographic surveys, and other scientific analysis to reveal and interpret the nature and behavior of pre-literate and non-literate peoples. Human population geneticists and historical linguists are also providing valuable insight for these questions. Cultural anthropologists help provide context for societal interactions, by which objects of human origin pass among people, allowing an analysis of any article that arises in a human prehistoric context. Therefore, data about prehistory is provided by a wide variety of natural and social sciences, such as paleontology, biology, archaeology, palynology, geology, archaeoastronomy, comparative linguistics, anthropology, molecular genetics and many others. The concept of a "Stone Age" is found useful in the archaeology of most of the world, though in the archaeology of the Americas it is called by different names and begins with a Lithic stage, or sometimes Paleo-Indian. The sub-divisions described below are used for Eurasia, and not consistently across the whole area. 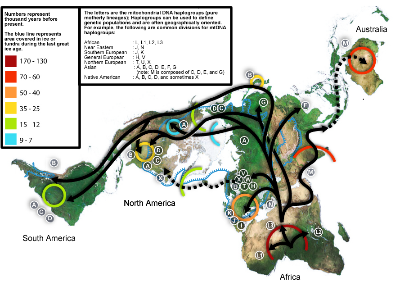 Map of early human migrations, according to mitochondrial population genetics. Numbers are millennia before the present (accuracy disputed). "Palaeolithic" means "Old Stone Age", and begins with the first use of stone tools. The Paleolithic is the earliest period of the Stone Age. The early part of the Palaeolithic is called the Lower Palaeolithic, which predates Homo sapiens, beginning with Homo habilis (and related species) and with the earliest stone tools, dated to around 2.5 million years ago. Evidence of control of fire by early humans during the Lower Palaeolithic Era is uncertain and has at best limited scholarly support. The most widely accepted claim is that H. erectus or H. ergaster made fires between 790,000 and 690,000 BP (before the present period) in a site at Bnot Ya'akov Bridge, Israel. The use of fire enabled early humans to cook food, provide warmth, and have a light source at night. Early Homo sapiens originated some 200,000 years ago, ushering in the Middle Palaeolithic. Anatomic changes indicating modern language capacity also arise during the Middle Palaeolithic. During the Middle Palaeolithic Era, there is the first definitive evidence of human use of fire. Sites in Zambia have charred bone and wood that have been dated to 61,000 BP. The systematic burial of the dead, music, early art, and the use of increasingly sophisticated multi-part tools are highlights of the Middle Paleolithic. Throughout the Palaeolithic, humans generally lived as nomadic hunter-gatherers. Hunter-gatherer societies tended to be very small and egalitarian, though hunter-gatherer societies with abundant resources or advanced food-storage techniques sometimes developed sedentary lifestyles with complex social structures such as chiefdoms, and social stratification. Long-distance contacts may have been established, as in the case of Indigenous Australian "highways" known as songlines. The Mesolithic, or Middle Stone Age (from the Greek mesos, 'middle', and lithos, 'stone'), was a period in the development of human technology between the Palaeolithic and Neolithic periods of the Stone Age. The Mesolithic period began at the end of the Pleistocene epoch, some 10,000 BP, and ended with the introduction of agriculture, the date of which varied by geographic region. In some areas, such as the Near East, agriculture was already underway by the end of the Pleistocene, and there the Mesolithic is short and poorly defined. In areas with limited glacial impact, the term "Epipalaeolithic" is sometimes preferred. The Mesolithic is characterized in most areas by small composite flint tools: microliths and microburins. Fishing tackle, stone adzes and wooden objects, e.g. canoes and bows, have been found at some sites. These technologies first occur in Africa, associated with the Azilian cultures, before spreading to Europe through the Ibero-Maurusian culture of Northern Africa and the Kebaran culture of the Levant. However, independent discovery is not ruled out. Entrance to the Ġgantija phase temple complex of Ħaġar Qim, Malta, 3900 BCE. "Neolithic" means "New Stone Age." Although there were several species of human beings during the Paleolithic, by the Neolithic only Homo sapiens sapiens remained. (Homo floresiensis may have survived right up to the very dawn of the Neolithic, about 12,200 years ago.) This was a period of primitive technological and social development. It began about 10,200 BCE in some parts of the Middle East, and later in other parts of the world and ended between 4,500 and 2,000 BCE. The Neolithic is a progression of behavioral and cultural characteristics and changes, including the use of wild and domestic crops and of domesticated animals. Early Neolithic farming was limited to a narrow range of plants, both wild and domesticated, which included einkorn wheat, millet and spelt, and the keeping of dogs, sheep and goats. By about 6,900–6,400 BCE, it included domesticated cattle and pigs, the establishment of permanently or seasonally inhabited settlements, and the use of pottery. The Neolithic period saw the development of early villages, agriculture, animal domestication, tools and the onset of the earliest recorded incidents of warfare. The Neolithic era commenced with the beginning of farming, which produced the "Neolithic Revolution". It ended when metal tools became widespread (in the Copper Age or Bronze Age; or, in some geographical regions, in the Iron Age).The term Neolithic is commonly used in the Old World, as its application to cultures in the Americas and Oceania that did not fully develop metal-working technology raises problems. The monumental building at Luni sul Mignone in Blera, Italy, 3500 BCE. Settlements became more permanent with some having circular houses with single rooms made of mudbrick. 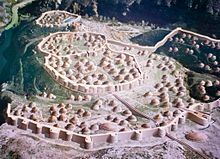 Settlements might have a surrounding stone wall to keep domesticated animals in and protect the inhabitants from other tribes. Later settlements have rectangular mud-brick houses where the family lived together in single or multiple rooms. Burial findings suggest an ancestor cult where people preserved skulls of the dead. The Vinča culture may have created the earliest system of writing. The megalithic temple complexes of Ġgantija are notable for their gigantic structures. Although some late Eurasian Neolithic societies formed complex stratified chiefdoms or even states, states evolved in Eurasia only with the rise of metallurgy, and most Neolithic societies on the whole were relatively simple and egalitarian. Most clothing appears to have been made of animal skins, as indicated by finds of large numbers of bone and antler pins which are ideal for fastening leather. Wool cloth and linen might have become available during the later Neolithic, as suggested by finds of perforated stones that (depending on size) may have served as spindle whorls or loom weights. In Old World archaeology, the "Chalcolithic", "Eneolithic" or "Copper Age" refers to a transitional period where early copper metallurgy appeared alongside the widespread use of stone tools. During this period, some weapons and tools were made of copper. This period was still largely Neolithic in character. It is a phase of the Bronze Age before it was discovered that adding tin to copper formed the harder bronze. The Copper Age was originally defined as a transition between the Neolithic and the Bronze Age. However, because it is characterized by the use of metals, the Copper Age is considered a part of the Bronze Age rather than the Stone Age. An archaeological site in Serbia contains the oldest securely dated evidence of copper making at high temperature, from 7,500 years ago. The find in June 2010 extends the known record of copper smelting by about 800 years, and suggests that copper smelting may have been invented in separate parts of Asia and Europe at that time rather than spreading from a single source. The emergence of metallurgy may have occurred first in the Fertile Crescent, where it gave rise to the Bronze Age in the 4th millennium BCE (the traditional view), though finds from the Vinča culture in Europe have now been securely dated to slightly earlier than those of the Fertile Crescent. Timna Valley contains evidence of copper mining 9,000 to 7,000 years ago. The process of transition from Neolithic to Chalcolithic in the Middle East is characterized in archaeological stone tool assemblages by a decline in high quality raw material procurement and use. North Africa and the Nile Valley imported its iron technology from the Near East and followed the Near Eastern course of Bronze Age and Iron Age development. However the Iron Age and Bronze Age occurred simultaneously in much of Africa. Ox-drawn plow, Egypt, c. 1200 BCE. The Bronze Age is the earliest period in which some civilizations have reached the end of prehistory, by introducing written records. The Bronze Age or parts thereof are thus considered to be part of prehistory only for the regions and civilizations who adopted or developed a system of keeping written records during later periods. The invention of writing coincides in some areas with the early beginnings of the Bronze Age. Soon after the appearance of writing, people started creating texts including written accounts of events and records of administrative matters. While copper is a common ore, deposits of tin are rare in the Old World, and often had to be traded or carried considerable distances from the few mines, stimulating the creation of extensive trading routes. In many areas as far apart as China and England, the valuable new material was used for weapons but for a long time apparently not available for agricultural tools. Much of it seems to have been hoarded by social elites, and sometimes deposited in extravagant quantities, from Chinese ritual bronzes and Indian copper hoards to European hoards of unused axe-heads. By the end of the Bronze Age large states, which are often called empires, had arisen in Egypt, China, Anatolia (the Hittites) and Mesopotamia, all of them literate. The Iron Age is not part of prehistory for all civilizations who had introduced written records during the Bronze Age. Most remaining civilizations did so during the Iron Age, often through conquest by the empires, which continued to expand during this period. For example, in most of Europe conquest by the Roman Empire means that the term Iron Age is replaced by "Roman", "Gallo-Roman" and similar terms after the conquest. In archaeology, the Iron Age refers to the advent of ferrous metallurgy. The adoption of iron coincided with other changes in some past cultures, often including more sophisticated agricultural practices, religious beliefs and artistic styles, which makes the archaeological Iron Age coincide with the "Axial Age" in the history of philosophy. Although iron ore is common, the metalworking techniques necessary to use iron are very different from those needed for the metal used earlier, and iron was slow-spreading and for long mainly used for weapons, while bronze remained typical for tools, as well as art. All dates are approximate and conjectural, obtained through research in the fields of anthropology, archaeology, genetics, geology, or linguistics. They are all subject to revision due to new discoveries or improved calculations. BP stands for "Before Present (1950)." BCE stands for Before Common Era". c. 300,000–30,000 BP – Mousterian (Neanderthal) culture in Europe. c. 200,000 BP – Anatomically modern humans (Homo sapiens sapiens) appear in Africa, one of whose characteristics is a lack of significant body hair compared to other primates. See e.g. Omo remains. c. 80,000–50,000 BP – Homo sapiens exit Africa as a single population. In the next millennia, descendants from this population migrate to southern India, the Malay islands, Australia, Japan, China, Siberia, Alaska, and the northwestern coast of North America. c. 45,000 BP / 43,000 BCE – Beginnings of Châtelperronian culture in France. c. 32,000 BP / 30,000 BCE – Beginnings of Aurignacian culture, exemplified by the cave paintings ("parietal art") of Chauvet Cave in France. c. 30,500 BP / 28,500 BCE – New Guinea is populated by colonists from Asia or Australia. c. 26,500 BP – Last Glacial Maximum (LGM). Subsequently, the ice melts and the glaciers retreat again (Late Glacial Maximum). During this latter period human beings return to Western Europe (see Magdalenian culture) and enter North America from Eastern Siberia for the first time (see Paleo-Indians, pre-Clovis culture and Settlement of the Americas). c. 26,000 BP / 24,000 BCE – People around the world use fibers to make baby-carriers, clothes, bags, baskets, and nets. c. 25,000 BP / 23,000 BCE – A settlement consisting of huts built of rocks and mammoth bones is founded near what is now Dolní Věstonice in Moravia in the Czech Republic. This is the oldest human permanent settlement that has been found by archaeologists. c. 23,000 BP / 21,000 BCE – Small-scale trial cultivation of plants in Ohalo II, a hunter-gatherers' sedentary camp on the shore of the Sea of Galilee, Israel. c. 16,000 BP / 14,000 BCE – Wisent sculpted in clay deep inside the cave now known as Le Tuc d'Audoubert in the French Pyrenees near what is now the border of Spain. c. 9,400–9,200 BCE – Figs of a parthenocarpic (and therefore sterile) type are cultivated in the early Neolithic village Gilgal I (in the Jordan Valley, 13 km north of Jericho). The find predates the domestication of wheat, barley, and legumes, and may thus be the first known instance of agriculture. c. 9,000 BCE – Circles of T-shaped stone pillars erected at Göbekli Tepe in the Southeastern Anatolia Region of Turkey during pre-pottery Neolithic A (PPNA) period. As yet unexcavated structures at the site are thought to date back to the epipaleolithic. c. 8,000 BC / 7000 BCE – In northern Mesopotamia, now northern Iraq, cultivation of barley and wheat begins. At first they are used for beer, gruel, and soup, eventually for bread. In early agriculture at this time the planting stick is used, but it is replaced by a primitive plow in subsequent centuries. Around this time, a round stone tower, now preserved at about 8.5 meters high and 8.5 meters in diameter is built in Jericho. c. 3,700 BCE – Cuneiform writing appears in Sumer, and records begin to be kept. According to the majority of specialists, the first Mesopotamian writing was a tool that had little connection to the spoken language. c. 3,300 BCE – Approximate date of death of "Ötzi the Iceman", found preserved in ice in the Ötztal Alps in 1991. A copper-bladed axe, which is a characteristic technology of this era, was found with the corpse. c. 3,000 BCE – Stonehenge construction begins. In its first version, it consisted of a circular ditch and bank, with 56 wooden posts. ^ "Dictionary Entry". Retrieved 8 August 2017. ^ Graslund, Bo. 1987. The birth of prehistoric chronology. Cambridge:Cambridge University Press. ^ Fagan, Brian (2017). World prehistory: a brief introduction (Ninth ed.). London: Routledge. p. 8. ISBN 978-1-317-27910-5. OCLC 958480847. ^ Forsythe, Gary (2005). A critical history of early Rome : from prehistory to the first Punic War. Berkeley: University of California Press. p. 12. ISBN 978-0-520-94029-1. OCLC 70728478. ^ Connah, Graham (2007-05-11). "Historical Archaeology in Africa: An Appropriate Concept?". African Archaeological Review. 24 (1–2): 35–40. doi:10.1007/s10437-007-9014-9. ISSN 0263-0338. ^ a b Matthew Daniel Eddy, ed. (2011). Prehistoric Minds: Human Origins as a Cultural Artefact. Royal Society of London. ^ Eddy, Matthew Daniel (2011). "The Line of Reason: Hugh Blair, Spatiality and the Progressive Structure of Language". Notes and Records of the Royal Society. 65: 9–24. doi:10.1098/rsnr.2010.0098. ^ Eddy, Matthew Daniel (2011). "The Prehistoric Mind as a Historical Artefact". Notes and Records of the Royal Society. 65: 1–8. doi:10.1098/rsnr.2010.0097. ^ The Prehistory of Iberia: Debating Early Social Stratification and the State edited by María Cruz Berrocal, Leonardo García Sanjuán, Antonio Gilman. Pg 36. ^ The Essence of Anthropology 3rd ed. By William A. Haviland, Harald E. L. Prins, Dana Walrath, Bunny McBrid. Pg 83. ^ Race and Human Evolution. By Milford H. Wolpoff. p. 348. ^ Vanishing Voices : The Extinction of the World's Languages. By Daniel Nettle, Suzanne Romaine Merton Professor of English Language University of Oxford. pp. 102–103. ^ Earle, Timothy (1989). "Chiefdoms". Current Anthropology. 30 (1): 84–88. doi:10.1086/203717. JSTOR 2743311. ^ "Songlines: the Indigenous memory code". Radio National. 2016-07-08. Retrieved 2019-02-18. ^ "Hagarqim « Heritage Malta". Archived from the original on 2009-02-03. Retrieved 2009-02-20. ^ "World Museum of Man: Neolithic / Chalcolithic Period". World Museum of Man. Archived from the original on 21 October 2013. Retrieved 21 August 2013. ^ Lyras; et al. (2008). "The origin of Homo floresiensis and its relation to evolutionary processes under isolation". Anthropological Science. ^ Leonard D. Katz Rigby; S. Stephen Henry Rigby (2000). Evolutionary Origins of Morality: Cross-disciplinary Perspectives. United kingdom: Imprint Academic. p. 158. ISBN 978-0-7190-5612-3. ^ Harris, Susanna (2009). "Smooth and Cool, or Warm and Soft: Investigatingthe Properties of Cloth in Prehistory". North European Symposium for Archaeological Textiles X. Academia.edu. Retrieved 5 September 2013. ^ Green, Jean M (1993). "Unraveling the Enigma of the Bi: The Spindle Whorl as the Model of the Ritual Disk". Asian Perspectives. 32 (1): 105–124. Archived from the original on 2015-02-11. ^ "Serbian site may have hosted first copper makers". ScienceNews. July 17, 2010. ^ Shea, J.J. 2003. Neanderthals, competition and the origin of modern human behaviour in the Levant. Evolutionary Anthropology 12: 173–187. ^ Toups, M.A. ; Kitchen, A.; Light, J.E. ; Reed, D. L. (September 2010). "Origin of Clothing Lice Indicates Early Clothing Use by Anatomically Modern Humans in Africa". Molecular Biology and Evolution. 28 (1): 29–32. doi:10.1093/molbev/msq234. PMC 3002236. PMID 20823373. ^ "Mount Toba Eruption – Ancient Humans Unscathed, Study Claims". Retrieved 2008-04-20. ^ Zimmer, Carl (September 21, 2016). "How We Got Here: DNA Points to a Single Migration From Africa". New York Times. Retrieved September 22, 2016. ^ a b This is indicated by the M130 marker in the Y chromosome. "Traces of a Distant Past", by Gary Stix, Scientific American, July 2008, pp. 56–63. ^ Gary Presland, The First Residents of Melbourne's Western Region, (revised edition), Harriland Press, 1997. ISBN 0-646-33150-7. Presland says on p. 1: "There is some evidence to show that people were living in the Maribyrnong River valley, near present day Keilor, about 40,000 years ago." ^ Gene S. Stuart, "Ice Age Hunters: Artists in Hidden Cages." In Mysteries of the Ancient World, a publication of the National Geographic Society, 1979. pp. 11–18. ^ "Venus of Willendorf". Khan Academy. Retrieved 2019-02-18. ^ Stuart, Gene S. (1979). "Ice Age Hunters: Artists in Hidden Cages". Mysteries of the Ancient World. National Geographic Society. p. 19. ^ Stuart, Gene S. (1979). "Ice Age Hunters: Artists in Hidden Cages". Mysteries of the Ancient World. National Geographic Society. pp. 8–10. ^ "Shift from Savannah to Sahara was Gradual", by Kenneth Chang, New York Times, May 9, 2008. ^ "No-Till: The Quiet Revolution", by David Huggins and John Reganold, Scientific American, July 2008, pp. 70–77. ^ Glassner, Jean-Jacques. The Invention of Cuneiform: Writing In Sumer. Trans.Zainab, Bahrani. Baltimore: The Johns Hopkins University Press, 2003. Ebook. ^ Caroline Alexander, "Stonehenge", National Geographic, June 2008.